We've been chasing after Razer's Pro|Type keyboard for quite some time now. 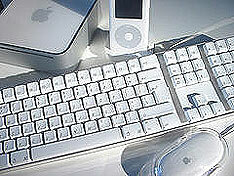 It's the only keyboard that lets you dock your iPod (or in some instances your Zune) directly onto your keyboard. The problem is, it's only a prototype. But apparently Apple has its own iPod keyboard in the works and has mistakenly shipped a small number of them to a lucky bunch of customers that had taken their standard keyboards in for repair. I'm gonna call bluff on this one (just cause I don't think Apple would make a mistake that big), but MacWorld is just around the corner, so here's hoping I'm wrong.